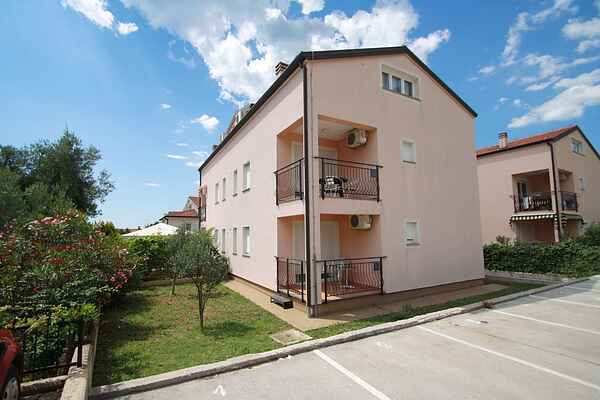 Nicely furnished apartment with two bedrooms and terrace, 1 km from the beach. The apartment is on the ground floor and is new and very comfortable. It includes a double bedroom, a room with 2 single beds, kitchen with living room and sofa bed, bathroom with shower and a terrace. The kitchen is equipped with electric cooker, oven, refrigerator, coffee maker and toaster. There is also wireless internet, satellite TV and air conditioning. A private car park is in front of the house. If you want a quiet holiday, you can come to this small place. This area is only 3 km from the center and only 1 km from the beaches. Here you can find pebble beaches, stone beaches and many small coves. In an active holiday you can make bicycle tours, walks, beach volley, mini golf and play tennis, or borrow boats. The area is ideal for families who are planning a nice and relaxing holiday.